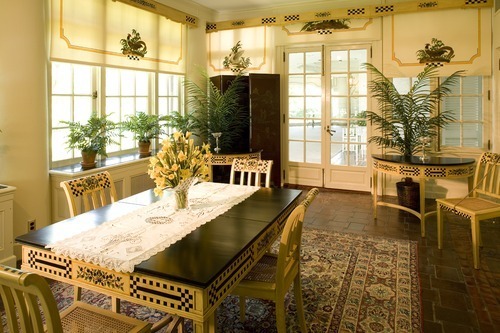 Breakfast rooms were introduced into the plans of country houses so that the first meal of the day could be enjoyed in cheerful, light-filled surroundings. Since the family was likely to be dressed casually, simple furniture was preferred. The checked pattern in this breakfast room was inspired by the leading international modernist group, the Wiener Werkstatte (Vienna Workshop), which was centered in the Austrian capital. Josef Hoffmann, one of its founders, was known for his creative use of a checkered motif that also appeared in metalwork, wall decoration, and fashion.